Eat. Write. Teach. 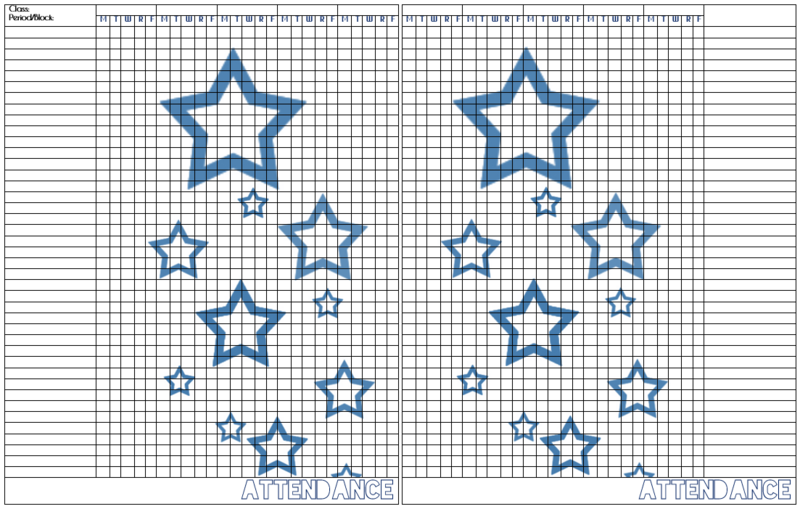 : Yay for More Printables! Happy Monday! Just popping in to share with you that I've added some new goodies to my TPT store, all of which are Sanity Saver items! So you already knew that I updated the calendar, right? Okay, so the first BRAND NEW REALLY COOL I'M PRETTY PUMPED UP ABOUT IT item is a new Sanity Saver Month-At-A-Glance product. It looks like this! 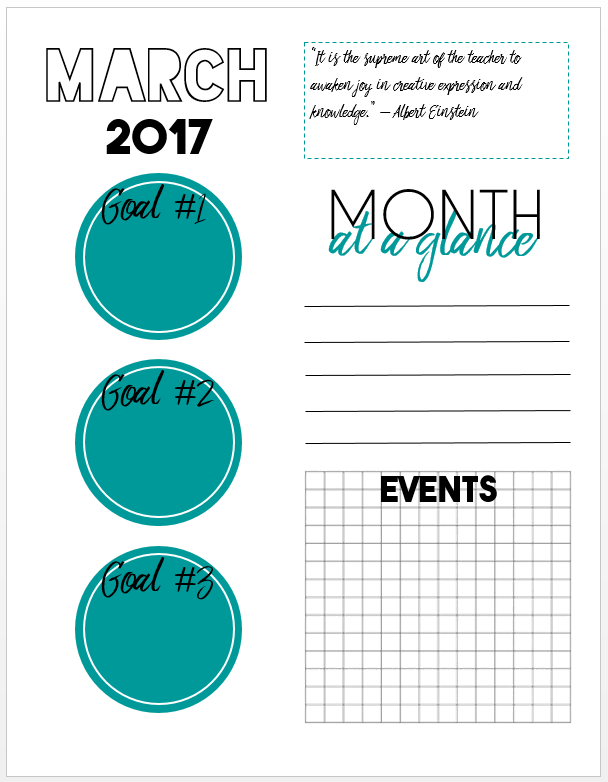 These printables are designed to give you a quick idea of what your upcoming month looks like. Each Month-at-a-Glance page features spots to write down each month's top three goals, a grid for jotting down events, lines for brief note-taking, an an inspirational quote. The months are color-coordinated with the new calendars and would make great divider pages! The next new item is actually an old product that DESPERATELY needed revamped! I present to you the new and improved Sanity Saver Ultimate Grade Book. Each two-page spread looks like this. This grade book is unique because, instead of trying to cram the test name, date, and any special notes you have onto the score page, you have a table where you can write down this information. 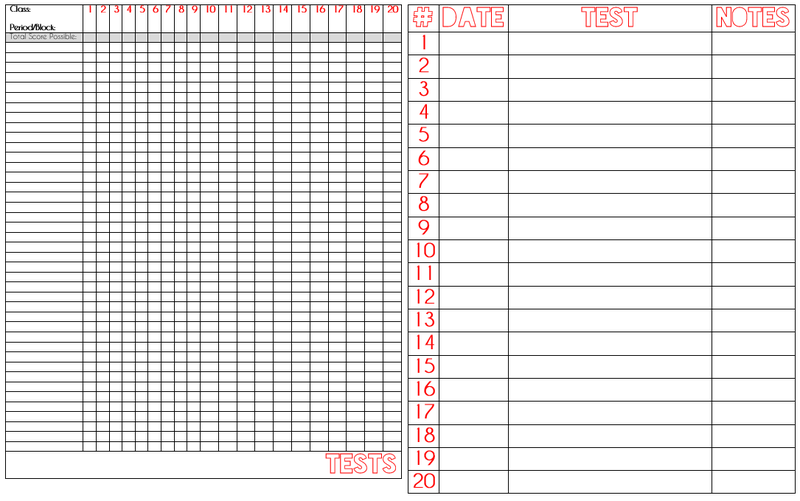 Each test is numbered, so you can just plug in the score next to the student's name and then write down all the notes your heart desires on the adjacent table. The grade book includes five sections: tests, quizzes, homework, and then two that are not labeled so that you can use them for whatever you like. 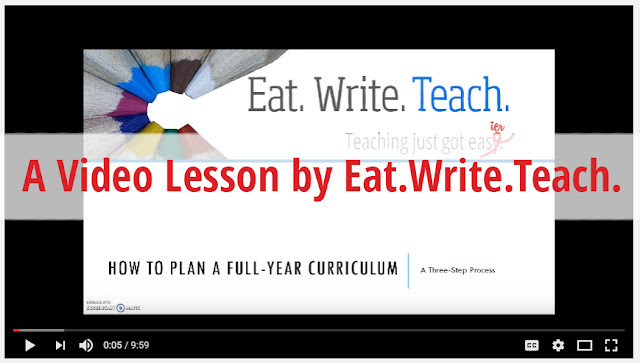 This would be a great place to keep track of Socratic Seminar participation, classroom activities, special projects, writer's workshop products, etc. Or, you could use it as a generalized checklist. The fonts and colors also go along very nicely with the other new Sanity Saver products for this year. I learned the hard way this year that it's just a bad plan to rely solely on your school's grade book software of choice. I will be returning back to keeping a paper copy of my grades this year in addition to the one on the computer. 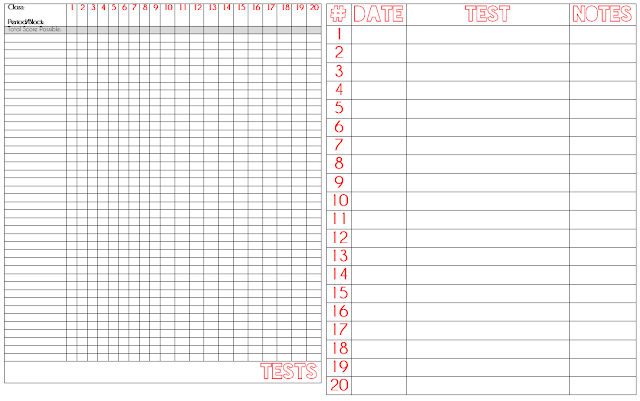 And finally, the third item is a tidied up Sanity Saver Attendance Record. One thing I always found troubling about generic teacher grade books and attendance records is that there wasn't enough space. I feel like so many of them had only twenty-five or thirty spaces. I have some really big classes and I needed to space to accommodate that. This spread has space for forty-one student names and ten weeks worth of attendance. You could print one per class per semester (or however you want to do it) and you would have room for ALL the attendance! Changes to this include a tidier layout and cleaner fonts that match the new Sanity Saver materials. IMPORTANT: if you already bought this attendance record from my store, you should be receiving a notification from Teachers Pay Teachers that there is an updated version. Since the changes were minimal to this product, you would not have to buy it again. Just download the update! Psst... not sure what a Sanity Saver is? Check out the origin story and the update from 2015-2016.